Responding to a mysterious beacon, the Enterprise comes to the aid of an injured and stranded Borg. This episode has the honor of being the only Star Trek I was ever forced to watch by a teacher in school. My 11th grade English teacher was a huge Trekkie, and she showed the class "I, Borg" after we read Anthem by Ayn Rand. She was trying to make a point about how themes and ideas can translate easily from high-brow literature to mass-consumed television shows--and she was also trying to emphasize the central ideas in both Anthem and "I, Borg" that deal with the nature of individuality versus extreme collectivism--and the message was not lost on me. Her class inspired me to delve deeper into "simple" entertainment, and it was an early step on my path to being the overly-analytical consumer of television, books, and movies that I am today. In fact, you can probably credit a lot of my thoughts in all of these notes to that English teacher. As a side note, you can also find Anthem-inspired themes in Rush's 2112. One of the more interesting aspects of this story, from a character standpoint, is how it focuses on the bitter prejudices of Picard and Guinan, the two characters on the show who seem the least likely to be prejudiced. Using Dr. Crusher yet again as a foil against Picard, as she was in "The Perfect Mate," runs the risk of turning her character into an annoying cliché and crutch. The writers fell into a similar pattern with Dr. Pulaski in the second season. The writers don't appear to have any good ideas of how to push Dr. Crusher forward, making her an incredibly static character. At first, La Forge is completely disinterested in the ethical conundrum, choosing to follow orders without putting much thought into why he's following them. This character trait helps define his analytical, engineering-focused mentality, but it also makes him come across as a little cold early in the episode. Luckily, even though this episode is squarely focused on Picard, by making La Forge the first convert to Hugh's humanity, this story reveals a dynamic aspect to La Forge that we haven't seen before. One glaring nitpick that always bugs the crap out of me is when Hugh says, "Do I have a name?" This is well before he stops using "we" to identify himself. And for the record, "Hugh" is a stupid name. It's really wild seeing Guinan in a completely different light, as she goes to Picard, genuinely seeking advice. This is not something you would ever expect to see her do. It shows a vulnerable side of her, a side that makes her less seemingly omniscient and more human. The scene between Picard and Hugh is gripping stuff. Having Hugh think Picard is Locutus is a perfect way to frame the scene, and it lets Picard really embrace his own demons and assumptions in the most intense way. Though it's a neat narrative flourish, I don't fully understand why they expect Hugh to transmit his understanding of individuality to the Borg collective. After all, whenever the Borg assimilate anyone, don't they assimilate that same sense of individuality? 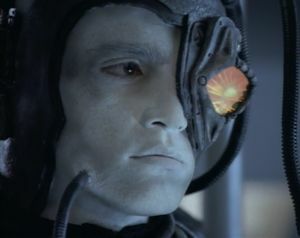 From what we know of the Borg, it makes sense that, as a collective, they would look at Hugh's memories, decide that individuality is irrelevant, comb his experiences for valuable information about the Enterprise, and then purge the rest. To say Picard's revised plan is a dangerous gamble built on dreamy hopes is to make a serious understatement. When Picard is discussing past experiences with the Borg with Crusher, he says, "They ignored every away team we sent over there, even yours, Doctor." This is a nice bit of continuity, showing that the writers are paying attention to detail. This is an excellent episode that manages to find a new way to use the Borg, developing them alongside our characters. A lot of thought and care went into this story, and as a result, it is both smart and provocative. Good stuff. This is, of course, a preamble to "Descent." VOY's Seven of Nine can be seen as an extension of ideas found in this episode, a kind of "what if" exploration of the notion that Hugh could have stayed behind.